Here's an podcast interview that Caity McCardell from Run Barefoot Girl did. I haven't heard it yet. I hope she edited it so I sound intelligent! I’d like to respond back to your post, because I think I disagree with your approach, though I want to say up front that I respect you as a runner and an advocate for barefoot running. 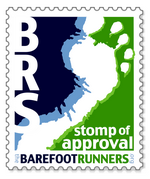 What bothers me is that I think you are constructing what is called a ‘straw man’ argument, which means that your main ‘point’ is something no one would really disagree with: That we barefoot runners shouldn’t be assholes to people. I don’t think anyone on the BRS would disagree with that statement, nor do I think any barefoot runner would identify herself as “fanatical” or rude, or overly zealous. That is, nobody really thinks they’re being as rude as what these shod runners seem to have claimed to you. What bothers me about proposing that we shouldn’t be assholes/fanatical/rude is that there’s an assumption that we are assholes/fanatical/rude, both by you, and by the shod runners you talked to in this race. I’m curious why/how you took these people at face value. That is, I’m genuinely curious about what they said about what they supposedly rude barefooters said to them. I only say this because it has been my experience, and others on this site, and you (like when you ran Burning River-you mention some guy in your write up about that being really rude to you) that shod runners can be really rude and/or at least inconsiderate, and that the number of rude shod runners vastly outnumbers barefoot runners period, much less whatever supposedly rude people exist in our tribe. For example, in many races I’ve run, I’ve had people literally talk behind my back, thinking (maybe? but maybe conscious of it?) that I can’t hear them if they’re ten feet behind me. Or the guy who ran up next to me in a 10K and said, “Are you born to run?” And laughed. I don’t know, I just didn’t find that funny. I could go on. In fact, one last example: People that start a ‘conversation’ with something like, “So I’ve heard about this barefoot fad...” Implying by the use of “fad” that they already kind of think it’s a silly idea. Perhaps that’s a teachable moment. Perhaps, in ideal conditions, I would be willing to engage with someone like that, but to top it off, their timing is not necessarily good: Many times I’m on the tail end of a marathon, or trying to run really fast in a 10K, when comments happen, when I really have better things to worry about. I’m wondering if these runners you talked to in the race perhaps approached barefoot runners in a non-tactful manner and/or if they were a little distracted. I actually do admit, when someone is a rude to me, it’s hard not to give a little ‘dig’ back. I would never be rude or ignore someone who came to me with genuine curiousity and politely initiated a conversation (assuming I wasn’t on Mile 40 or a 50 Miler or something). The worst I ever get is when I feel someone is being a little smartass-y and passes me saying, “How’s your feet?” My reply is something like, “Fine. How are yours?” Because I feel that it seems pretty obvious that my feet are ok, otherwise I’d stop running. Now if someone wants to argue that saying “How’s your feet?” is actually friendly, well, it just never seems that way. Maybe I’m a little defensive, but it’s hard not to be when people say some fairly hurtful things about me. I can handle someone saying, “That dude’s crazy!” and take it as a sign of respect, but if someone says, “I don’t know why anyone would do that” instead of maybe asking me why I do it, well then, I’m feeling judged. I would just like to be treated with respect. I also have an issue with the diagram you use to demonstrate how an idea is accepted by the “majority.” That is, it sounds interesting, and may be true, but I’m not sure it’s absolutely true. What the source for this “diffusion of technology” chart? Is it really accepted by experts in the field? Or is it something you came up with? I’m actually even willing to believe it’s in part true, but I think there are a lot more factors than just how people talk about an idea, as to whether it becomes popular. Another big example I can think of is marketing by corporations. Remember that in Born to Run Christopher McDougall proves fairly conclusively that Nike manufactured a demand for ‘running’ shoes. I return to the idea that I started on: that I feel you are implying that we barefoot runners are either the problem, or else somehow morally obligated to act in a certain way. I don’t think anyone is going out of their way to be rude to shod runners. I don’t see us barefoot runners as doing anything wrong. My experience has actually been that going barefoot kind of angers and confuses some people, and as a side note I think that has something to with people’s core beliefs being challenged: If running without shoes is in fact ok, and even fun and healthy, then who knows what other beliefs people have might be true? They may have to start actually questioning. The horror. Nor do I really care about the early or late majority’s opinion. I run barefoot because it feels good to me. I do think barefoot running is good for people. I would recommend it. But I’m not shouting it from the rooftops. Nor am I telling people they’re idiots for using Nike shoes. Nor to I feel I need to modify my behavior in order to keep barefoot running alive. The best way to show/teach someone something is by being a model. If someone wants to (in a friendly manner) talk to me, excellent, but I’m not an extroverted personality like I suspect you may be (Which is good. You’re a good ambassador!). I like running because it’s a solitary activity, and is really a form of meditation for me. I’m sorry if this comes off as very strong. Something in your post really resonated with me, and made me think about how I think about barefoot running, and for that I thank you. I would welcome any thoughts you have on what I've written. Again, you are an awesome runner (shod or bare) and you’ve done more to introduce the idea of barefoot running than maybe anybody. I hope to run into you at some races this summer.